If you have purchased some or all of the discs in this newly minted set, we thank you very much for your support. This page is for you to read about the music on the disc(s) of out World War One songs. If you have not yet purchased any of the discs or the set, we invite you to peruse this page to see more about the music on these discs and preview some of the songs. We hope that you will support us by purchasing one or all of the discs. All funds go to the support of The Parlor Songs Academy, an IRS 501(c)(3) public charity. To purchase the discs, go to our store page for more information and a link to purchase the discs. World War One was a watershed event in the development of American (and European) popular and patriotic music. We've written a full set of articles that review the music of the period and if you've not read the articles, see the link at the end of this page to read them, see more music of the War and listen to other songs of the times. This two part CD set of 40 songs (plus a companion disc of ten more) provides a cross section of the great music that came out of the war. As with all wars we have been involved in, there were differing opinions as to the righteousness of the war. Those opinions were reflected in the beliefs of various composers through their music. Though the overwhelming majority of songs were supportive of the war and extolled the virtues of our troops and our country, some composers protested the war with songs that depicted their disagreement with our involvement. No where is this difference more apparent in a pair of songs written on the same subject but from very different points of view. Before the war as we were about to enter it, many songs were written from the viewpoint of mothers who happily were offering up their sons for combat. However, in 1915 Al Piantadosi and Alfred Bryan penned the song I Didn’t Raise My Boy to be a Soldier, a clear protest to the idea of sacrificing our youth to someone else’s war. You can hear this song and many others on Volume one of this set. Richard Beil and Debbie Purdue have collaborated to bring you a wonderful survey of some of the best songs of the war; happy ones, sad ones, patriotic ones and a few protests. 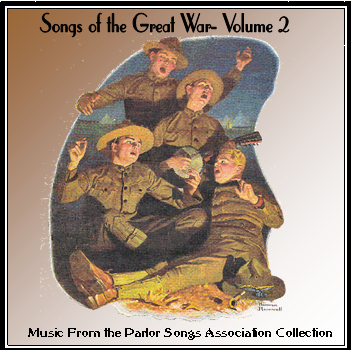 Their talents are well suited for music of this era in American song history and I know that you will thoroughly enjoy hearing some of the well known and lesser known yet beautifully crafted public domain songs of the First World War. Cost of disc $15, postage to US destinations included. To purchase this disc go here. 1. Over There (w/m George M. Cohan-1917) – The most famous and recognizable song of WW I. In 1936, Congress authorized a special medal for Cohan in recognition of all his patriotic songs and, in particular, this one. Given Cohan’s penchant for self-promotion, in his mind Cohan turned this into the Congressional Medal of Honor and it was portrayed as such in the 1942 bio-pic Yankee Doodle Dandy. However, there is no record or citation among the records of Medal of Honor recipients. This duet is a “reprise” of the one done by James Cagney and Frances Langford in that movie. As you can see, this famous painting by Rockwell (only two or three were painted by him) has been used as the cover image for our CD set. 2. Where Do We Go From Here (m. Percy Wenrich, w. Howard Johnson–1917) – A song of Percy's that made a lot of dough for him and yet is scarcely recalled today. "Curious thing about that one," Percy recalled, "Feist called me over to his office one day. Says, 'Percy, all the war tunes the boys sang in the past were just rum-ti-tum gags having nothing to do with fighting. Take 'Hot Time in the Old Town,' which was the hit of the Spanish-American War. Go ahead and knock one out and beat the rest of 'em to it.' So I asked Howard Johnson to do me a lyric. The next day he brought down a verse and chorus. 'It's lousy, Percy,' he said, 'But you can use it for a dummy, and I'll give you something better later.' It was 'Where Do We Go From Here?' a screwy lyric if ever there was one about a Broadway cabby who sang the refrain to his fares: 'Oh, joy, oh, boy, where do we go from here?' We never changed a line of it. 3. How Ya Gonna Keep 'Em Down On the Farm (m. Walter Donaldson, w. Sam Lewis and Joe Young-1918) – When the U.S. entered the war in 1917, the population was still rural. Many of the “doughboys” had never been outside their home county when they were called up to serve. This song speaks to their transformation after seeing the “outside world” for the first time. This song, addresses a reality of life that was not only faced by individual soldiers, but to our country as well. Prior to the war, though we were involved in a number of conflicts, our country was quite isolated and we tried to stay out of the war. The war changed this country and our fighting men in ways that would never allow us to go back to the "old days." The sentiment here is that once your world opens up, it will never be the same. Once the boy sees the lights and sights of Paris, how can you ever expect them to want to go back to hauling hay bales. Listen to an MP3 sample of this song. 4. Hello Central, Give Me No Man’s Land (m. Jean Schwartz, w. Sam Lewis and Joe Young-1918) – Another great song by this lyrics team. The effect of war on children and family played a huge part in the music of the war. The bewilderment and simple understanding of children makes for great musical story telling. This song was introduced by the great Al Jolson in the stage play Sinbad at the Winter Garden in New York. This same show also spawned the mega-hit Swanee by George Gershwin. Though Sinbad was a war oriented production, it managed to balance the war issues with plenty of other sentiments. The song tells the story of a child trying to contact her father at the war's front, unfortunately she has not yet been told, her father has been killed. 5. We’re Going Over (m. Bernie Grossman, w. Art Lange and Andrew Sterling-1917) – As we pointed out in our 2004 essay "Music as Propaganda", many of the songs written for the war use "we" in the lyrics, an effective strategy that allows direct participation by those singing the song. Plus the word "we" creates a group effort, a solidarity of thought and action, all goals of effective propaganda. This was a tune first recorded by the Peerless Quartet. Andrew Sterling was also the lyricist for “Wait ‘Til the Sun Shines Nellie”. The excitement generated by our entry into the war resulted in a number of "going over" songs that were meant to depict the positive attitude and belief that the war would be a quick one with few casualties. Later, reality proved otherwise. As with a number of songs Rich has done on our earlier releases, on this tune he is singing all 4 harmony parts. Listen to an MP3 sample of this song. 6. Send Me Away With a Smile (m. Al Piantadosi, w. Louis Weslyn-1917) –Although Piantadosi would go on to write a number of patriotic numbers during the war, he was decidedly anti-war prior to U.S. entry in 1917. Although it’s unclear whether the young man in this tune has enlisted or been drafted, here we have the story of a young man who’s off to the war, explaining to his girl that it’s something he must do. He implores her to understand that he considers it his duty to go, asking “you would not have me stay behind” and wanting a smile from her as the last thing he sees so that he’ll have it to remember once he gets to the battlefield..
7. Oh, How I Wish I Could Sleep Until My Daddy Comes Home (m. Pete Wendling, w. Sam Lewis and Joe Young-1918) One of the many “tear-jerkers” written during the war. The song was a hit for Al Jolson who was deeply affected by the First World War and sang a number of songs that spoke to the pain of loss and futility of war. His soulful singing style lent itself to this kind of doleful song and Jolson could play it up like few others could. This particular song is typical of his wartime efforts and speaks to the loss a child feels for a daddy who is "over there." "There'd be no war today, If mothers all would say, 'I didn't raise my boy to be a soldier'." The cover of the sheet music portrays exploding shells bursting around an old gray-haired woman protecting her son. This song adapted easily to a ragtime form (popular music style then) played by popular pianists, which enabled it to become widely disseminated, an important aspect of effective propaganda. In fact, the publisher Leo Feist boasted that more than 700,000 copies were sold in the first eight weeks. 9. It’s Time For Every Boy To Be a Soldier (m. Harry Tierney, w. Alfred Bryan-1917) This song is an “answer” to the previous song and interestingly the lyricist, Alfred Bryan, has completely changed his mind about the war. The cover depicts Lincoln and Woodrow Wilson, suggesting that America's decision to fight in World War I was morally and ethically equal to that of our own Civil War. Of course, it would take historians years to fully describe the subterfuges employed by Wilson to change public opinion and get us into that war. Note that the lyricist here is the same one who wrote the lyrics for the previous anti-war song. In some cases, these apparent changes of heart may have been driven more by the desire to sell songs and avoid censure than a true heartfelt change in political views. Perhaps political correctness began much earlier than we think. 10. Bring Back My Daddy To Me (m. Geo. W. Meyer, w. William Tracy and Howard Johnson-1917) Another example of the wartime “tear jerker” . Here we have a beautiful song about a child who is about to experience another birthday but rather than conventional presents, she naively asks mother to bring daddy back home from the war for her birthday. The simplicity of a child's world comes through well in this tender ballad. If only it were so simple! The beautiful child on the cover is Madge Evans, "Famous Child Star - - World Pictures." Madge Evans was born in 1909 which would have made her all of eight years old when this song was published. The effect of the war on children as you can see, was a prolific source of music during this war. 12. And He’d Say Oo-la-la, Wee Wee (m. Harry Ruby, w. George Jessel – 1919) – This is charming comic song about a French lady and American soldier overcoming their language barrier in a delightful way! The lyricist, George Jessel had a long career stretching from vaudeville to motion pictures. A great comedian, in his later life he became known as "Toastmaster General of the United States" for his frequent role as master of ceremonies at political and entertainment events. This is a charming, comic song about a French lady and American soldier overcoming their language barrier in a delightful way! There wre many such songs written during the war, almost all of them novelty songs. Later, on disc 2, you'll hear one of the best, "When Yankee Doodle Learns to Parlez Vous Francais." 13. & 14. I’m Going To Follow The Boys (m. James Monaco, w. Howard Rogers-1917) These years were the pre suffrage years in America and not only could women not vote but their participation in military affairs were severely restricted. As a result, their role and the subject of songs about them were focused on support and wishes to join them. THis is one of many outstanding songs on the subject. During the vaudeville era, there were many great male/female teams, such as the husband and wife team of Jack Norworth and Nora Bayes. Other performers would team with different partners at different times. There were two duets done of this tune that we could find, one between Billy Murray and Rachel Grant and another done by Henry Burr and Elizabeth Spencer. As a bonus track, we've included a recreation of the Burr/Spencer duet by Rich and Debbie in the manner of an old acoustic recording from 1917. 15. The Rose of No Man’s Land (m. James A. Brennan, w. Jack Caddigan-1918) – A tribute to the American Red Cross. On the war's front lines, a huge role was played by the Red Cross. Family and friends at home who were worrying about their loved ones were grateful to The Girl Who Wore A Red Cross On Her Sleeve; little Mary Brown who grew up as a tom boy but; "Now She's Over There, giving up her life at duty's call, and the ones who used to sneer, are the first ones now to cheer, and the little good for nothing's good for something after all." One of the greatest classic Red Cross songs is The Rose of No-Man's Land, by James A. Brennan and Jack Caddigan published by Feist in 1918. 16. Tell That To the Marines (w/m Bernard S. Barron-1918) - A scornful response to a tall and un believed story. This phrase actually originated in England. Most of the early citations give a fuller version of the phrase - "You may tell that to the marines, but the sailors will not believe it". The cover shows a re-creation of the actual recruiting poster (at right), substituting Al Jolson as the fellow removing his coat, although Jolson did not enter the military and it's somewhat curious as to why. The first round of conscription in June 1917, took men between the ages of 21 and 31. Jolson had just turned 31 years old the previous month. 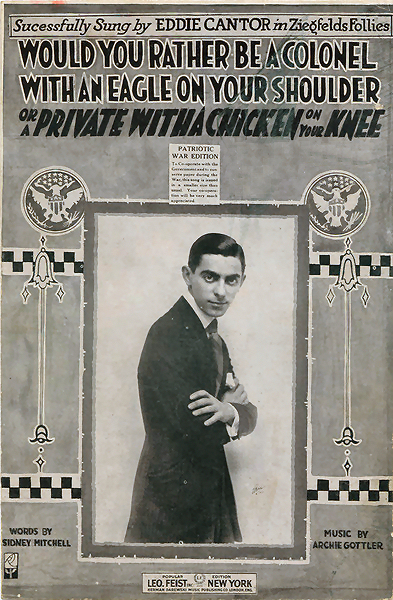 By contrast, Irving Berlin who was just as famous at the time as Jolson, had turned 29 in May 1917 and was drafted. Go figure. 17. When You Come Back (w/m George M. Cohan-1918) – Although not as famous as “Over There”, this is another lively number by one of America’s greatest patriotic composers. Though Cohan wrote a number of war related classic songs none ever quite rose to the level of Over There, but many were still outstanding. In 1918 Cohan, like many of the composers, focused on the war's end and the hope of every family for the safe return of their loved one's who had gone off to fight the Hun. That year he wrote the typically Cohan optimistic, When You Come Back. This song was written as a sequel of sorts to Over There but never reached much popularity. Perhaps it's greatest virtue is the fabulous cover photo of Cohan surrounded by a terrific patriotic and colorful background. 18. Mother, Here’s Your Boy (m. Archie Gottlier and Theodore Morse, w. Sidney Mitchell-1918) – As mentioned above about I Didn't Raise My Boy To Be a Soldier" and It's Time For Every Boy To Be a Soldier sentiment about the war changed dramatically between 1915 and 1917. Here we have a tune written just after the Armistice that ended the war that is expressing thanks, both to the soldiers who fought and to the mothers who made the sacrifice. Earlier songs about mothers' sacrifices focused on them gladly giving up their sons and in some cases husbands for the good of the country. Though the songs portrayed that willingness to sacrifice for America, the pain and sorrow of mothers' losses were rarely depicted. 19. You’ll Have To Put Him To Sleep With the Marseillaise and Wake Him Up With an Oo-La-La ( m. Harry VonTilzer, w. Andrew Sterling-1918) During the war, many of the American soldiers used to go out with the French girls nearby. As with the other "language" songs, the soldiers learned enough French to get by and came to enjoy some of the music of France. No doubt, the extent of language learned was directly related to the need for, ah-hem, female companionship. Those of us who have taken French in school, can probably relate to the essential phrases needed then and the ones we felt compelled to learn. This song from the World War I era lets the American girls know just what will be expected of them when their soldier boys return home. 20. You Can’t Blame the Girlies At All (m. Abner Silver, w. Alex Gerber-1917) Not really a patriotic or "war" song, this cute tune tells why "ev'ry girl wants to marry a soldier". Because of his experience in the Army, a soldier makes the perfect "catch". He knows how to peel potatoes and scrub floors. He will protect them and even ask for a pass if he wants to go out with the boys. Coming home from the war with this type of training, you certainly can't blame the girlies at all. This novelty song has some clever lyrics and a tune that will stick with you for a while. The writers of this song were some of the lesser known songwriters who contributed to the war effort but in this case, their work deserves to be heard again and again. 1. Sister Susie’s Sewing Shirts For Soldiers (m. Hermann Darewski, w. R.P. Weston-1914) - An enjoyable novelty song made famous by Al Jolson. During the war, knitting socks, sweaters, gloves, hats and scarves for the boys over there was an important home bound women's contribution to the war. A number of other songs during this time focused on the issue of knitting (or in this case, sewing shirts) were written but few other than this one reached hit status. In many of his shows, Jolson would offer $50 to anyone in the audience who could sing this song without a mistake. By prearrangement, he would have the orchestra speed up the tempo through the song, making it impossible for anyone to win the money. 2. Somewhere In France Is Daddy (w/m Great Howard-1917) As with songs here, such as Bring Back My Daddy To Me and Oh, How I Wish I Could Sleep Until My Daddy Comes Home, some songwriters chose to tell the story from the point of view of the children who find it difficult to understand why daddy is away. Although many of those songs fit the "tear jerker" category, this is a rousing march tempo in which the mother is telling her son that daddy is "fighting for home and country. Fighting my lad for liberty". The sheet music attributes the song to "Great Howard" which is a rather strange name however, research shows that the composer was none other than Joseph Edgar Howard (1867 - 1961) a Broadway composer who wrote lyrics for a number of shows including Show Boat. Why he resorted to this odd pseudonym however is undiscovered by us. 3. Three Wonderful Letters From Home (m. James F. Hanley, w. Joe Goodwin and Ballard McDonald-1918) –Here we have a wonderful song about family and home. Having been in the service, Rich and I can attest to the importance of letters from home. It gets lonesome out there, even in peace time and I can only imagine how much more important it would be if I were sitting in a muddy trench with nothing but death and destruction around me. This song tells us about a soldier who receives three letters of love and support from home, one each from his mother, wife and daughter. It is another touching and well written ballad from the golden age of song. 4. Would You Rather Be a Colonel With an Eagle on Your Shoulder (m. Archie Gottlier, w. Sidney Mitchell-1918) In the military, there is a big difference between officers and enlisted men, both in what is expected and what is allowed. These differences are summarized in this delightful novelty tune that has a father asking his son why he hasn't advanced in rank like other soldiers. The son replies that he'd much prefer remaining a Private because the officers must act with so much dignity that they can't get the girls. You'll notice on the sheet music cover that this tune was performed by Eddie Cantor. For those who remember him, it is quite easy to picture those rolling eyes as he sings this song. 5. We Don’t Want the Bacon (What We Want Is a Piece of the Rhine) w/m Howard “Kid” Carr, Harry Russell and Jimmy Havens-1918) Even back in 1918, before the creation of Madison Avenue, songwriters knew about marketing. As we chronicled in our 2008 article Where Does Music Come From, it's difficult to tell which came first, the melody or the lyrics. But, back in 1918, before radio and the widespread use of the phonograph, unless you went to the theater, you would not have heard many of the songs. It was when you went into the music store that someone would sit down and play a selection for you. Of course, the songwriter wanted to catch the eye of a potential buyer. Sometimes the attraction would be the beautiful art work of the covers. In this case, as with the previous song, it's the title that jumps out and grabs you. Imagine browsing the sheet music counter and seeing this song. The immediate reaction would probably be, "I've just GOT to hear this!" 6. Roses of Picardy (m. Haydn Wood, w. Frederick E. Weatherley-1916) Picardy refers to the region in France just north of Paris. Weatherly wrote the lyrics while he was an army officer stationed in France in 1916. He reportedly wrote it after falling for a French widow in whose home he had sought protection. Among the earliest commercial recordings were those by Ernest Pike in 1917 and John McCormack in 1919. As late as 1967, Vince Hill had a top 20 hit with the song. There was also speculation that during World War II, the Germans were singing it in their own language, including the Bavarian Corps, Hitler’s rifle regiment. 7. When I Send You a Picture of Berlin (m. Dave Dreyer, w. Frank Fay-1918) Born as Francis Anthony Donner in San Francisco, California, Fay was an American film and stage actor, emcee, comedian, best-known as an actor for having played "Elwood P. Dowd" in the play Harvey. Jimmy Stewart played the role in the film version. Jack Benny stated that he modeled his early stage character on Fay. Dave Dreyer was a composer and pianist born on September 22, 1894 in Brooklyn, New York. He died on March 2, 1967 in New York City. He started off as a pianist with vaudeville greats such as Al Jolson, Sophie Tucker, Belle Baker, and Frank Fay. In 1923 he worked for the Irving Berlin Music Company. While there, he worked numerous film scores. He later became the head of the music department of RKO Radio. He left the Music Company in 1949. 8. When Yankee Doodle Learns To Parlez-vous Francais (m. Will Hart, w. Ed Nelson-1917) One of the greatest novelty songs to ever come out of the First World War is this lilting and gay song about the difficulties and ultimate benefits of learning the French language. The music and lyrics to this song are absolutely perfect. The music, in a military quick time march style combines familiar melodies (Yankee Doodle) with new ones to create an outstandingly memorable melody; the kind that sticks in your head and just won't go away! The lyrics are humorous and fit the melody so well I can't imagine that two minds created the lyrics and melody rather than one. Sometimes a song writing team strikes gold and Nelson and Hart absolutely did so with this one. 9. I Don’t Want To Get Well (m. Harry Jentes, w. Howard Johnson and Harry Pease-1917) Of course the boys over there were all enthused about coming home..or were they? Here is one guy who not only wasn't ready to come home, but he didn't want to get well either. At least until his "beautiful nurse" was ready to go. This is a great novelty song from the war that makes light of being wounded and adds some humor to an otherwise worrisome situation. Here we have a wounded soldier who has fallen in love with his nurse and is enjoying all the pampering she gives him. He says to a friend back home in a letter; "She holds my hand and begs me not to leave her, Then all at once I get so full of fever, I don't want to get well." I know you will enjoy this cute and original song. Another great duet by Rich and Debbie, based on a performance by Arthur Fields and Grace Woods. 10. You Keep Sending Them Over and We’ll Keep Knocking Them Down (m. Harry Ruby, w. Sidney Mitchell-1918) Another aspect of the World War I song was that they were written not from the “high” vantage point of the Generals, but from the “worm’s eye” view of the ordinary soldier. Of course, the songwriters back in the U.S. did not actually see the death and carnage. It was easy for them to depict the soldiers as both supremely confident, calling for the Kaiser to “send on ev’ry Hun, no matter how tall. The bigger they are, the harder they fall”. One has to wonder how many of these "send 'em at us" songs the soldiers heard while slogging through the trenches and their reaction. Seeing all the death and destruction in their own trenches would probably cause them to want to say, "please stop sending 'em over!" 11. Just a Baby’s Prayer At Twilight (m. M.K. Jerome, w. Sam Lewis and Joe Young-1918) The kids at home were important and many songs were written addressing that like the fourth song on Disc 1, , Hello Central Give Me No Man's Land and Just a Baby's prayer at Twilight (For Her Daddy Over There), by the same songwriters as this one. Here we have the story of how prayers can touch you but this child's prayer for their daddy made them cry. It is a sweet ballad that I'm sure touched many a heart. The number of heart rending songs about kids and their loss makes one wonder whether or not these songs were a subtle anti-war statement reflecting the suppressed anti-war feelings of a number of composers. 12. K-K-K Katy (w/m Geoffrey O’Hara-1918) Another of the very memorable songs of the Great War, but one whose verses are largely forgotten. Canadian-born Geoffrey O'Hara was a multi-talented musician who, during the course of his life, was a songwriter, composer, singer, teacher, lecturer, army singing instructor, ethnomusicologist, pianist and guild organizer. His lengthy career began in the first decade of the 1900s with minstrelsy, vaudeville and Tin Pan Alley, and he continued to entertain audiences and arrange music as late as the 1960s. There are conflicting stories of how "K-K-K-Katy" came to be written. O'Hara himself, writing in Maclean's magazine in 1921, said he wrote the melody while stationed at Fort Oglethorpe, Georgia, teaching the American troops patriotic songs. However, the family of the Katy of the song's title (Katherine Craig Richardson) remembers it as being written in their living room in Kingston, Ontario, in 1917, and indeed this version of events is the best known. Katy was a friend of O'Hara's sister and O'Hara was particularly fond of her even after she married. Yet another version of events has O'Hara writing the song while visiting his grandfather in Kingston. In any case, "K-K-K-Katy" became an instant wartime hit and one that is still associated with Kingston. It was especially popular with American, Canadian and British servicemen and their families, so much so that the sheet music sold over one million copies. Hear an MP3 sample of this song. 13. It’s a Long Way To Tipperary (w/m Jack Judge-1912) A British music hall and marching song. It is co-credited to, but not co-written by Henry James “Harry” Williams. It was allegedly written for a 5 shilling bet in Stalybridge, England on 30 January 1912 and performed the next night at the local music hall. Judge's parents were Irish, and his grandparents came from Tipperary. During the First World War the Irish regiment, the Connaught Rangers, were witnessed singing this song as they marched through Boulogne on 13 August 1914 by the Daily Mail correspondent George Curnock, who reported the event in that newspaper on 18 August 1914. The song was then picked up by other units of the British Army. In November 1914 it was recorded by the well-known tenor John McCormack, which helped contribute to its worldwide popularity. 14. Pack Up Your Troubles in Your Old Kit Bag (m. Felix Powell, w. George Henry Powell-1915) Written in London by George Henry Powell under the pseudonym of "George Asaf", and set to music by his brother Felix Powell. The song was entered in a music contest for “best morale-building song”. It won first prize. Felix Powell served as a staff sergeant in the British Army. His brother George was a pacifist and became a conscientious objector when Britain imposed conscription in 1916. The song was recalled in the title of the 1932 Laurel and Hardy film Pack Up Your Troubles where the duo are drafted and make a friend who dies during the war, then in its aftermath try to reunite his orphaned baby daughter with her family. 15. When Alexander Takes His Ragtime Band To France (m. Edgar Leslie, w. Alfred Bryan and Cliff Hess-1918) A clear “take off” on “Alexander’s Ragtime Band”, this tune even uses one of Irving Berlin’s musical phrases from the earlier song. If you try to google any phrase that includes "Alexander's Ragtime Band" you'll get a return of thousands of pages bout the 1911 Irving Berlin song represented by those words. The song was all the rage in 1911 and you can see in this song that the caché of the song lasted for many years after. A number of songs were written that capitalized on the fame of ARTB and this is but one of them. 16. Keep The Home Fires Burning (m. Ivor Novello, w. Lena Ford-1914) a British patriotic First World War song composed by Ivor Novello in 1914 with words by Lena Gilbert Ford, whose middle name was sometimes printed as "Guilbert". The song was first published as 'Till the Boys Come Home on October 8, 1914 by Ascherberg, Hopwood, and Crew Ltd. in London. A new edition was printed in 1915 under the name Keep the Home-Fires Burning. The song became very popular in the United Kingdom during the war, along with It's a Long Way to Tipperary. Stanley Kirkby recorded Keep the Home-Fires Burning in 1916, as did James F. Harrison in 1915. Another popular recording was sung by tenor John McCormack in 1917, who was also the first to record It's a Long Way to Tipperary in 1914. The song was included in the 1969 musical Oh What a Lovely War and in the 1970 musical film Darling Lili. 17. It’s a Long Way To Berlin But We’ll Get There (m. Leon Flatow, w. Arthur Fields-1917) This song achieved instant success when published by Leo Feist, Inc in 1917. The title is reminiscent of the hugely popular British wartime anthem It's a Long Way to Tipperary written in 1912. Unlike that song, which is still familiar today, this one has faded from our musical consciousness as have most songs of the war save the most impressive such as "Tipperary" and Over There. Flatow and Fields are also little known today however they were important songwriters in the early years of America's music. Flatow was a pioneer of film music,and played piano in Loew's first movie house. He composed theme songs for a number of silent films for Paramount. Fields was best known as a singer who recorded a number of songs after some success as a songwriter. His 1919 recordings with bandleader Ford Dabney may be the very first recordings of a white singer backed by a black band. 18. Somewhere In France Is the Lily (m. Joseph E. Howard, w. Philander Johnson-1917) A beautiful juxtaposition by the songwriters that uses the symbology of the national flowers of France and England to describe the close ties between those countries during the war. The song was quite popular and recorded by many of the great singers of the period. The lyricist, Philander Johnson stepped far from his usual role as a journalist, humorist, poet, and dramatic editor to collaborate on this song. Aside from being saddled with what may be the worst first name of anyone, Philander's humor generated a number of humorous quotes, some of which are still used and most as true today as they were 100 years ago including, "Cheer up, the worst is yet to come," "Don't throw a monkey-wrench into the machinery" and "Politics is the art of turning influence into affluence." 19. So Long Mother (m. Egbert Van Alstyne, w. Gus Kahn-1917) Van Alstyne, Kahn along with Raymond Egan published this great war song for one of America's greatest performers, Al Jolson. The song expressed the sentiments of many a young man of the day and who better to belt this one out than Jolson. According to the sheet music this work was one of Jolson's greatest hits and seems to fit his style like a glove. Interestingly, though the sheet music shows Jolson as the performer and states it is "Al Jolson's Mother Song," I'm unable to find when and where it might have been first performed by Jolson. I also cannot find any record of him ever recording the song. 20. America, I Love You (m. Archie Gottlier, w. Edgar Leslie-1915) Inspired by an early spirit of pro-war enthusiasm, Americans eagerly accepted patriotic messages portrayed in songs, allowing them to serve as strong vehicles for propaganda. Anti-war messages were replaced with songs such as I Did Not Raise My Boy to Be a Coward, and I'd Be Proud to Be the Mother of a Soldier. Americans heard, responded enthusiastically to, and sang, America, I Love You. The song appeared in the 1940 film Tin Pan Alley in it's original form and it emerged again early in the Second World War, featured in a 1942 "Castle soundie" short. The 1942 version was done in the jazzy style of the early 40's and is no where nearly as inspiring. This was one of the most popular songs of its day. Here, Rich and Debbie are joined by two additional vocalists, Peggy Wooden of Anderson, Missouri and Phyllis Lippay of Coal Township, Pennsylvania. Our thanks to those two wonderful singers for participating in this project. This is a perfect rousing end to this two disc set. Listen to an MP3 sample of this song. As with World War Two, many prominent entertainers and songwriters joined the fight during World War 1 by enlisting (or being drafted) in the military. 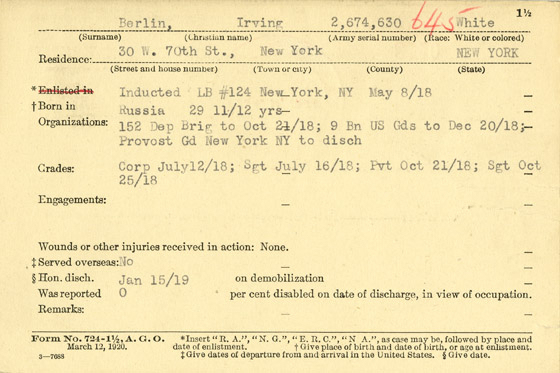 Irving Berlin was barely under the maximum age of 31 when he received notice of his induction into the Army in July of 1918. He never saw action but instead, spent his time at Fort Upton on Long Island, NY and there he used his talents in writing and producing an influential musical production Yip, Yip, Yaphank. His service record (below) shows his induction date, personal information at the time and his organizational assignments and grades. It is a bit interesting to us to note that for a very short period (4 days), Berlin was "busted" from Sergeant to Private, then back to Sergeant. We can't help wondering what infraction may have lead to that and why it was such a short period. Regardless of grade, Berlin contributed greatly to the music of both wars and on this special "bonus" disc, we celebrate some of his most memorable songs from WWI. This disc alone, $10 however it is a free gift to those who buy Disc one and two of the collection. To purchase this disc go here. 1. Oh, How I Hate To Get Up In The Morning – 1918. According to a notation by Berlin on the earliest surviving piano-vocal score of this song, it was “written and composed at Camp Upton, June 20, 1918. It was introduced in “Yip, Yip, Yaphank” by “Sergeant Irving Berlin. During the war, Berlin was drafted and was stationed at Camp Upton at Yiphank, Long Island, a temporary camp for those about to head to the front in Europe. It was here that Berlin was exposed to the infantryman's bane, the wake up bugler. According to the sheet music, Berlin dedicated the song to a fellow private, Howard Friend, "who occupies the cot next to mine and feels as I do about the Bugler." It was also at Upton that Berlin, convinced that the troops needed to be entertained, wrote an show that starred only soldiers, Yip, Yip Yaphank in 1918. Berlin was a terrible insomniac who worked all night and slept most of the day. So, getting up at the crack of dawn to the sound of the bugle drove him crazy. And, one of the reasons he proposed "Yip, Yip, Yaphank" to the Army brass was so he wouldn't have to get up at reveille. It worked. 2. For Your Country and My Country – 1917. Annotated on the sheet music as “The Official Recruiting Song”, it was written at the request of the War Department to specifically target immigrants. It was recorded by the Peerless Quartet, and by the opera star Francis Alda. Frances Langford performed the song in the 1943 film This Is the Army. 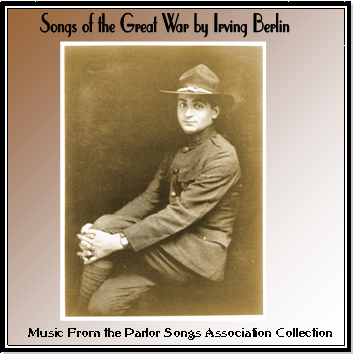 As with this title, many of Berlin's WWI songs were so good at engendering patriotism and patriotic service that they were resurected for the second war in 1941. A goodly number of the songs from his production Yip, Yip Yaphank were also included in This is the Army including this one and Oh How I Hate to Get Up in the Morning. Listen to an MP3 sample of this song. 3. I've Got My Captain Working For Me Now – 1919. After the war was over, it continued to have some effect on the music of the period. The subjects refocused from being away at war to the aspects of homecoming and adjusting to civilian life. One such after the war song was I’ve Got My Captain Working For Me Now, another of Berlin’s great novelty songs. The song one tells of a young man back from the war who hires his former commander and is able to exact “revenge” for the treatment he received while in the Army. As he says in the 2nd verse, “I’ve agreed to give him $50 per. It’s worth twice as much to hear him call me, Sir”. This song was a number 1 hit for Al Jolson. 4. I’m Gonna Pin My Medal On the Girl I Left Behind -1918. Introduced by Frank Carter (a Private) with Gus Minton (a General), Martha Mansfield (the Girl I Left Behind) and male ensemble in the Ziegfeld Follies of 1918. The song was recorded by the Peerless Quartet in 1918. This song anticipates the return home of a brave soldier who has "stood the test" and won himself a medal for his bravery. As with most heroes of war, humility is a virtue and in this soldier's mind, the bravery and loyal support given to him by his sweetheart in his mind requires that she receive the medal, not he. He tells us in the chorus; "I'm gonna pin my medal on the girl I left behind, She deserves it more than I, For the way she said goodbye, You should have seen her try to keep away the tears that blind, A braver hero Would be hard to find. She puts a smile in ev'ry letter she signs, But I can read what's in her heart between the lines. And when I get back I'm gonna pin my medal on the girl I left behind." 5. The Devil Has Bought Up All the Coal – 1918 Berlin at times seemed to be infatuated with the devil or the themes the devil could produce for song. In 1913 1914 he penned At The Devil's Ball, in 1914 He's A Devil In His Own Home Town and Stay Down Here Where You Belong. This song appeared in 1918 then even after the war he continued with the 1922 song, Pack Up Your Sins and Go To The Devil. Though all of these songs were good natured and generally made light of the Devil, I would say that Berlin was somewhat brave to approach a subject that so many songwriters and playwrights avoided like the plague. There was a belief in the mid 20th century that any movie with "devil" in the title was cursed and would not succeed. Berlin beat the odds on that belief long before it was openly stated. 6. They Were All Out of Step But Jim – 1918. The first recording of this song was done by Billy Murray. The rendition here is a duet between Rich and guest artist Peggy Wooden of Anderson, Missouri and is based on a rendition done in 1918 by Gus Van and Joe Schenck. The second great memorable song to come from Berlin during the War was this one, another novelty work that shows him at his best. Starting out as a private and eventually making it to Sergeant, Berlin certainly was wise to the ways of the front line soldier. Though he admitted he was not much of a soldier and that it was not his trade, Berlin served well and learned the basics in addition to helping morale of the troops and the folks at home. Certainly, a joke that has existed since soldiers started marching was the idea that when a soldier was out of step, it was everyone else who was wrong. With this song, Berlin codified the concept. 7. Goodbye France – 1918. A song that reflects the affection felt by Americans for France at that time. On disc one of this set we featured a song, Good-Bye Broadway, Hello France. It seems only appropriate as we come to the close of this set of songs that we end with a fond good-bye by our soldiers to the brave soldiers and people of France who endured the war more so than any other country. This is a very upbeat song by the great Irving Berlin (see our November, 1998 tribute to Berlin for more of his works) This song sparkles with the usual Berlin mastery of melody and lyrics. 8. Let’s All Be Americans Now – 1917. (Co-written with Edgar Leslie and George W. Meyer). Music composers, while entering the pro-war campaign for economic benefit, wrote songs which promoted the popular thinking aspired to by the government. Irving Berlin, (who had formerly composed some pacifist music), Edgar Leslie, and George W. Meyers released the patriotic song which was immediately recorded by the American Quartet whose members in 1917 were Billy Murray, John Young, Steve Porter, and William F. Hooley. The lyrics of this song reminded citizens about the ethnic diversity of the country while stressing the fact that all were joined nationally by citizenship. It encouraged all American citizens to put aside any previous loyalty to other homelands, and "fall in line/ You swore that you would,/ So be true to your vow, let's all be Americans now!" Wouldn't it be nice if all immigrants to America did the same today. 9. Kitchen Police (Poor Little Me) – 1918. Copyrighted September 19, 1918. Introduced as “Poor Little Me” in the Ziegfeld Follies of 1918. Sung by Sergeant Irving Berlin and chorus in Yip, Yip, Yaphank. The songs is a bit of an enigma for us as finding a copy with a cover image has proven to be an endless quest. Even searching library collections as far away as the Australian National Library has left us empty handed. Aside from its connection to Yip, Yip, there seems to be little information available to tell us more about the song. Therefore, we shall let the song's lyrics speak for themselves. The lament of the soldier assigned to KP (usually perceived as punishment) has been the source of a great deal of military humor. Once again, it was Irving Berlin who first introduced us to the misery of KP. This article published January 2011 and is Copyright © 2011 by Richard A. Reublin and The Parlor Songs Academy Text, images or music may not be reproduced in part or in total without express written permission of the author or an officer of the corporation. Though the songs published on this site are often in the Public Domain, MIDI renditions are protected by copyright as recorded performances. Thanks for visiting us and be sure to come back again later to see our next issue or just to read some or all of our over 130 articles about America's music. See our resources page for a complete bibliography of our own library resources used to research this and other articles in our series.